Of course, the water here is as clear as gin, and much more valuable,’ commented my ghillie, nodding at the chalkstream we were standing beside as he tied on another fly. He probably wasn’t joking. Britain is home to 95% of the world’s chalkstreams and they’re our equivalent of the rainforests: precious, endangered and utterly beautiful. They are also, rather extraordinarily, totally manmade. The author of Life of a Chalkstream, Simon Cooper, runs Fishing Breaks, a company that provides fishing on many of the finest rivers in the land. He’s a renowned fly-fisher himself and, in this book, he writes as well as he casts. This story of the triumphant return of a neglected stretch of a river at Gavelwood echoes Henry Williamson’s Salar the Salmon in many delightful passages on the various animals that inhabit this ecological wonderland. A perfect chalkstream is the ultimate environment for trout and, like so many field sports, what’s good for the quarry species is also heaven for others. If the trout are happy, the insects, water voles, bullheads, kingfishers, swans, otters, bats, field mice and salmon will be, too. 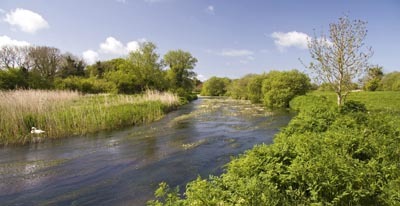 Chalkstreams were initially created by man to drain swampy marshes into channels that could drive a watermill; this, in turn, created wondrous, fertile pasture in the fields near the newly formed river. As the water mills passed into history, the rivers found a new role and the drowners arrived. These men worked in bitter winters to flood the surrounding fields in order to ward off harsh frosts. Chalkstreams flow at a constant 10˚ and flooding the pasture through a series of intricate sluices kept the grass free of frosts and enriched the land with the water’s nutrients. Later, in Victorian times, the art of dry fly-fishing was perfected by Frederic Halford on the River Test, creating a mad rush of grandees wanting to join in the latest field-sport fashion. Chalkstreams, like enormous, watery gardens, need managing. The gravel needs to be kept from becoming silted up, the banks need to be regularly cleared of vegetation and, most importantly, the weed growing in the river itself must be tended like a perfect herbaceous border. This weed is critical-it manages the flow, oxygenates the water and provides a home for the millions of insects at the bottom of the food chain. A monthly weed cut to create a perfect chequerboard-pattern takes place the length of the river. As the author and his team battle to turn Gavelwood back into a pristine trout river, the animals represent the trials, tribulations and successes. As the river improves, trout start to lay their eggs where none have been laid for decades. The cycles of life, from the mayfly that hatches as an insect before mating and dying in a single day, to the salmon and eels that spend their lives both at sea and in freshwater, are all revived. Mr Cooper is in love with chalkstreams and anyone who reads this splendid book will soon hold the same view.